For 1882-2018, the Reds' overall win-loss record is 10,524-10,306 (a 0.505 winning "percentage"). The Cincinnati Red Stockings left the American Association on November 14, 1889 and joined the National League along with the Brooklyn Bridegrooms after a dispute with St. Louis Browns owner Chris Von Der Ahe over the selection of a new league president. The National League was happy to accept the teams in part due to the emergence of the new Player's League. This new league, an early failed attempt to break the reserve clause in baseball, threatened both existing leagues. Because the National League decided to expand while the American Association was weakening, the team accepted an invitation to join the National League. It was also at this time that the team first shortened their name from "Red Stockings" to "Reds". The Reds wandered through the 1890s signing local stars and aging veterans. During this time, the team never finished above third place (1897) and never closer than 10​1⁄2 games (1890). Hall of famer Edd Roush led Cincinnati to the 1919 World Series. 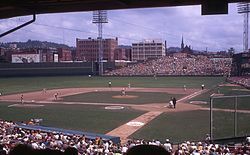 The Reds played at Crosley Field, pictured here in 1969, from 1912 to 1970. The 1972 Reds won the NL West in baseball's first ever strike-shortened season and defeated the Pittsburgh Pirates in an exciting five-game playoff series. They then faced the Oakland Athletics in the World Series. Six of the seven games were won by one run. With powerful slugger Reggie Jackson sidelined by an injury incurred during Oakland's playoff series, Ohio native Gene Tenace got a chance to play in the series, delivering four home runs that tied the World Series record for homers, propelling Oakland to a dramatic seven-game series win. This was one of the few World Series in which no starting pitcher for either side pitched a complete game. The Reds won 98 games in 1974 but they finished second to the 102-win Los Angeles Dodgers. The 1974 season started off with much excitement, as the Atlanta Braves were in town to open the season with the Reds. Hank Aaron entered opening day with 713 home runs, one shy of tying Babe Ruth's record of 714. The first pitch Aaron swung at in the 1974 season was the record tying home run off Jack Billingham. The next day the Braves benched Aaron, hoping to save him for his record-breaking home run on their season-opening homestand. The commissioner of baseball, Bowie Kuhn, ordered Braves management to play Aaron the next day, where he narrowly missed the historic home run in the fifth inning. Aaron went on to set the record in Atlanta two nights later. The 1974 season was also the debut of Hall of Fame radio announcer Marty Brennaman, who replaced Al Michaels, after Michaels left the Reds to broadcast for the San Francisco Giants. After the 1978 season and two straight second-place finishes, Wagner fired manager Anderson—an unpopular move. Pete Rose, who since 1963 had played almost every position for the team except pitcher, shortstop, and catcher, signed with Philadelphia as a free agent. By 1979, the starters were Bench (c), Dan Driessen (1b), Morgan (2b), Concepción (ss), Ray Knight (3b), with Griffey, Foster, and Geronimo again in the outfield. The pitching staff had experienced a complete turnover since 1976 except for Fred Norman. In addition to ace starter Tom Seaver; the remaining starters were Mike LaCoss, Bill Bonham, and Paul Moskau. In the bullpen, only Borbon had remained. Dave Tomlin and Mario Soto worked middle relief with Tom Hume and Doug Bair closing. The Reds won the 1979 NL West behind the pitching of Tom Seaver but were dispatched in the NL playoffs by Pittsburgh. Game 2 featured a controversial play in which a ball hit by Pittsburgh's Phil Garner was caught by Cincinnati outfielder Dave Collins but was ruled a trap, setting the Pirates up to take a 2–1 lead. The Pirates swept the series 3 games to 0 and went on to win the World Series against the Baltimore Orioles. GABP opened in 2003, becoming the seventh home field for the Reds. Great American Ball Park opened in 2003 along the Ohio River. 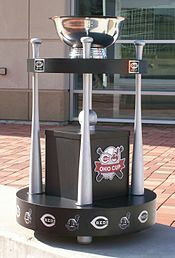 The Ohio Cup was an annual pre-season baseball game, which pitted the Ohio rivals Cleveland Indians and Cincinnati Reds. In its first series it was a single-game cup, played each year at minor-league Cooper Stadium in Columbus, was staged just days before the start of each new Major League Baseball season. 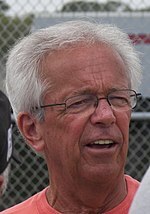 Marty Brennaman, the Hall of Fame "voice of the Reds"
In 2007, Thom Brennaman, a veteran announcer seen nationwide on Fox Sports, joined his father Marty in the radio booth. Retired relief pitcher Jeff Brantley, formerly of ESPN, also joined the network in 2007. As of 2010[update], Brantley and Thom Brennaman's increased TV schedule (see below) has led to more appearances for Jim Kelch, who had filled in on the network since 2008. Televised games are seen exclusively on Fox Sports Ohio and Fox Sports Indiana. In addition, Fox Sports South televises Fox Sports Ohio broadcasts of Reds games to Tennessee and western North Carolina. George Grande, who hosted the first SportsCenter on ESPN in 1979, was the play-by-play announcer, usually alongside Chris Welsh, from 1993 until his retirement during the final game of the 2009 season. Since 2009, Grande has worked part-time for the Reds as play-by-play announcer in September when Thom Brennaman is covering the NFL for Fox Sports. He has also made guest appearances throughout the season. Brennaman has been the head play-by-play commentator since 2010, with Welsh and Brantley sharing time as the color commentators. Paul Keels, who left in 2011 to become the play-by-play announcer for the Ohio State Buckeyes Radio Network, was the Reds' backup play-by-play television announcer during the 2010 season. Jim Kelch served as Keels' replacement. The Reds also added former Cincinnati First Baseman Sean Casey – known as "The Mayor" by Reds fans – to do color commentary for approximately 15 games in 2011. ^ Footer, Alyson (August 6, 2014). "Reds pay homage to past with 2015 All-Star logo". Reds.com. MLB Advanced Media. Retrieved April 21, 2018. The primary logo in the center of the illustration depicts the handlebar mustache and old-style square cap worn by the Reds' most traditional mascot, Mr. Redlegs. His perfectly round head sits on top of the Reds' classic oval-shaped "C." The crossed bats represent a traditional baseball design, while the addition of deep red creates dimension to the Reds' colors of red and black. ^ "History of Reds Logos". Reds.com. MLB Advanced Media. Retrieved January 13, 2019. ^ "Reds Timeline". Cincinnati Reds. August 26, 2015. Retrieved August 26, 2015. ^ "Cincinnati Reds Team History & Encyclopedia". Baseball Reference. Baseball Info Solutions. Retrieved 2019-02-27. ^ DeGange, John (16 April 1953). "Ins and Outs". The Day (New London, Connecticut). p. 10. Retrieved 27 May 2015. ^ "Sports People; Fingers Won't Conform". The New York Times. February 22, 1986. Retrieved April 30, 2010. ^ Rogers, Thomas (February 28, 1986). "SCOUTING; Times Change, But Reds Don't". New York Times. Retrieved April 21, 2018. For years, the Reds were the only team that permitted no color other than the standard black on their uniform shoes. But last year they allowed the players to paint red stripes on the shoes, and this year they're going to all-red models. The shoes are all supposed to match our red stockings, says a cautious Mrs. Schott. I just hope they don't come out shocking pink. ^ Taylor, Kelly. "Big Red Machine's "Great Eight" to reunite at GABP". FOX 19. FOX19-WXIX. Retrieved 6 September 2013. ^ Pahigian, Joshua; Kevin O'Connell (2004). The Ultimate Baseball Road-Trip: A Fan's Guide to Major League Stadiums. Guilford, Conn: Lyons Press. p. 208. ISBN 1592281591. ^ "1976 Cincinnati Reds Statistics and Roster". Baseball-Reference.com. Retrieved 2008-03-30. ^ "1981 Cincinnati Reds Statistics and Roster". Baseball-Reference.com. Retrieved 2008-03-30. ^ "1982 Cincinnati Reds Schedule, Box Scores and Splits". Baseball-Reference.com. Retrieved 2008-03-30. ^ "BASEBALL; Call for Schott to Step Down". New York Times. December 7, 1992. Retrieved 2008-03-30. ^ "Poor Communication at Heart of Feud". The Washington Post. May 12, 1998. Retrieved April 30, 2010. ^ "Ken Griffey Career Home Runs". Baseball-Reference.com. Retrieved January 25, 2017. ^ "Reds are NL Central Champs! | Cincinnati Reds". Cincinnati.com. 2010-09-28. Archived from the original on 2012-10-05. Retrieved 2012-06-19. ^ "MLB.com At Bat | MLB.com: Gameday". Mlb.mlb.com. 2010-10-06. Retrieved 2012-06-19. ^ "Reds dismiss manager Dusty Baker". ESPN.com. October 4, 2013. Retrieved March 11, 2014. ^ "Reds set to promote Price to manager". ^ "The Reds just set a record that sums up just how bad they have been this year". Retrieved 2016-09-27. ^ "Regular Season Standings". Major League Baseball. Retrieved 2017-01-06. ^ "Cincinnati Reds 2016 Team Transactions: Trades, DL, Free Agents and Callups - ESPN". ESPN.com. Retrieved 2017-01-06. ^ "Braves, Reds close deal for Brandon Phillips". MLB.com. Retrieved 2017-12-19. ^ "Hall of Fame & Museum | reds.com: Ballpark". Mlb.mlb.com. 2010-07-18. Retrieved 2012-06-19. ^ Yglesias, Matthew. "Communist Bo Xilai gets ousted: Why do communists like red so much?". Slate Magazine. Retrieved 2012-06-19. ^ Sheldon, Mark (December 1, 2006). 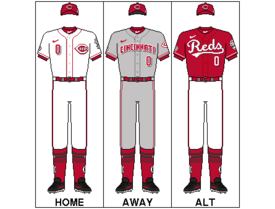 "Reds unveil new-look uniforms". Major League Baseball Advanced Media. Retrieved January 2, 2017. ^ "Hall of Famers: Sparky Anderson". National Baseball Hall of Fame and Museum. Retrieved August 11, 2016. ^ "Hall of Famers: Frank Robinson". National Baseball Hall of Fame and Museum. Retrieved August 11, 2016. ^ "FOX Sports Ohio announces 2011 Reds broadcast team | reds.com: Official Info". Cincinnati.reds.mlb.com. 2011-01-14. Retrieved 2012-06-19. This page is based on the Wikipedia article Cincinnati Reds; it is used under the Creative Commons Attribution-ShareAlike 3.0 Unported License (CC-BY-SA). You may redistribute it, verbatim or modified, providing that you comply with the terms of the CC-BY-SA.